We just might finally have a water dog again! 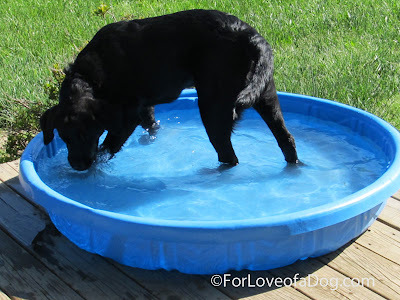 We got our first doggie swimming pool many years ago on the farm. Sherman and Spanky were thrilled. The pool had colorful fishies printed all over the bottom and Spanky loved to stick his head under the water and chomp at them to try and "catch" them. Sherman loved to just lay down, soak and cool off. To our great disappointment, Tucker, Lucy and Jeffie regarded their doggie swimming pool as a giant water bowl. No playing; no soaking. Just a tongue lap now and then. So much for the pool. Rudy got so excited about water - that's Rudy shown above when the creek overflowed into our yard - we thought we had a water dog. 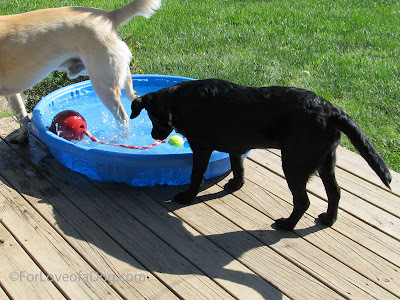 We were thrilled and picked up a little kiddie pool at the big box store. Our thought was that if he really liked it, we'd get him a bigger one. Well, Rudy did like to walk around in the doggie pool water. Sometimes he stomped a front foot down to splash. 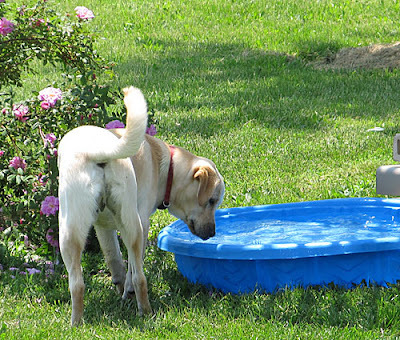 Unfortunately for us, he mostly thought it was a really big water bowl. Now we have Rosie, a very confident 6 month old puppy who's usually ready to try just about anything! What is this thing and why is it in my yard? They've put this thing on the deck now... where are Rudy and Jeffie? Hey guys, should I be afraid? Rudy says there's nothing to worry about. I've got to get my Jolly ball! Forget the Jolly ball. This is fun! Oooh... you can drink it! You can splash it! You can stick your head in it! Wow, my head is wet! I think I need a towel! 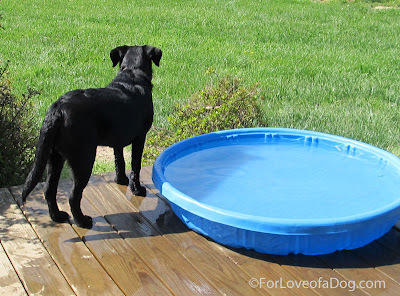 We now keep a "dog towel" by both the patio and back porch doors for our little swimmer. I managed to capture some video and when I've got some time, I'll get that uploaded to our YouTube channel. Rosie loves the water and I suspect there's a bigger doggie pool in her future! 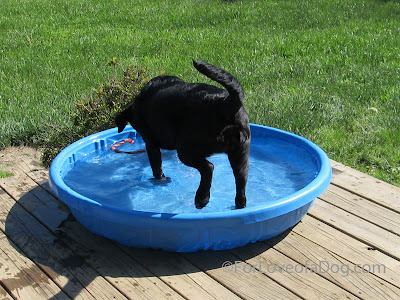 Hoping that Rosie will continue to play in it and not use it as a giant water bowl! Awww... too cute Rosie! Swimming is fun, huh?! Awww what fun! 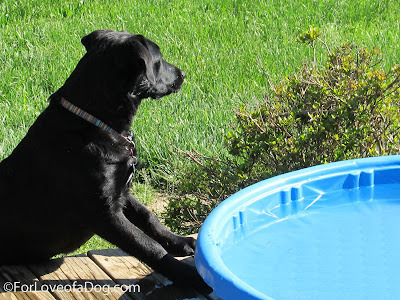 Shiner will swim in the lake, but she's never tried to swim in any kiddie pools that we've had for my daughter. She's weird with water... only likes to get wet in the lake. Cute! Have you tried a lake? Kirby pretty much ignores his kiddie pool but loves swimming at the lake. At the annual pooch pool party he turns up his nose at the wading pool and jumps in to swim in the big human pool. You might have water dogs afterall! 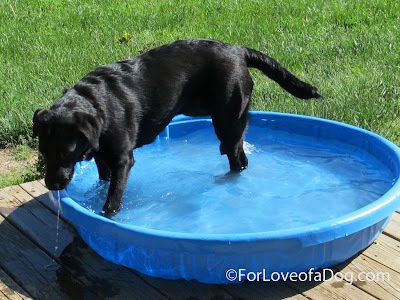 I like to soak in my pool and I often drink while I am soaking but my sister thinks it is just a big water bowl, so we understand how your pups are dealing with it! Rosie, you look like your having fun. My gang loves there pool. Very cute. 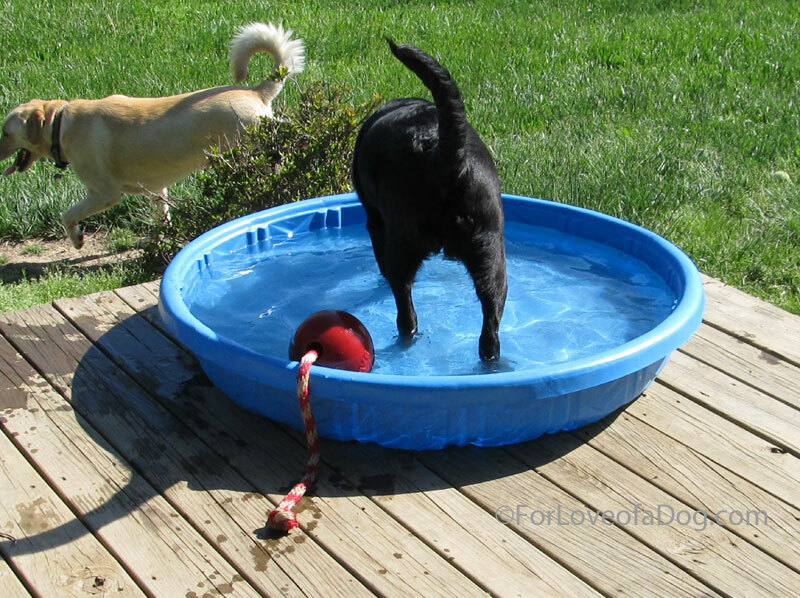 Our doggies splash all the water out of their pools. No soaking for them. You just gave me a great idea. My dog loves the water and sits in puddles to cool off after chasing her ball. 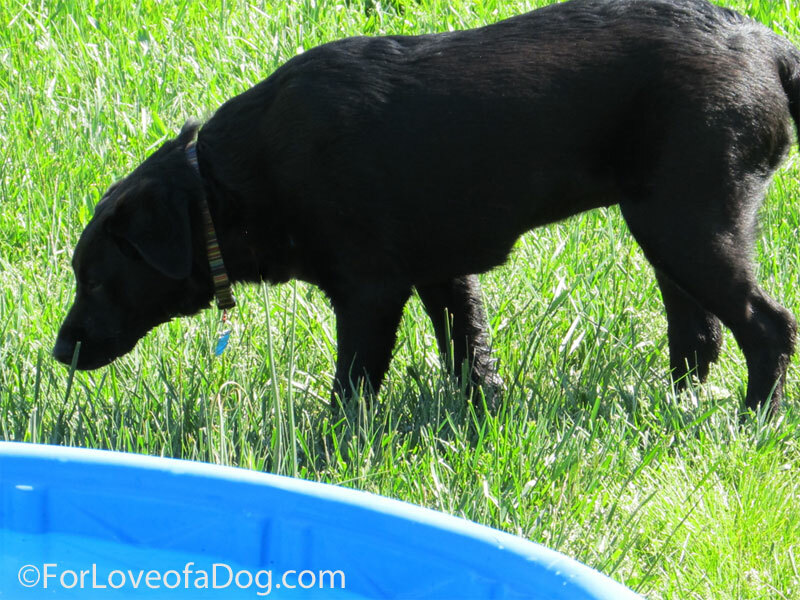 I'd much rather have her in her own clean pool than getting all muddy from the puddles! Fun! 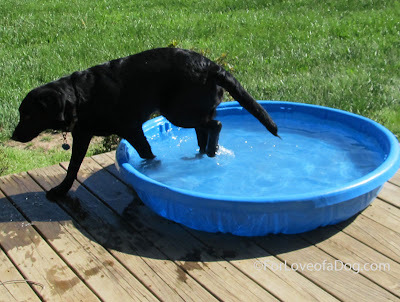 Most dogs I've had didn't care for the kiddie pool. But Maya loves it! Sampson loves to lie down in the pool after a hot walk, he cools his belly down that way and will drink the water. In larger bodies of water such as inground pools and lakes, streams, etc he will simply walk in and lie down or take a lap around. Delilah is the total opposite. The little pool is for drinking, she will sometimes stand in it to get a drink or if we are rinsing her off, but other than that she leaves it. Bring her to a lake, river or large pool and watch out! 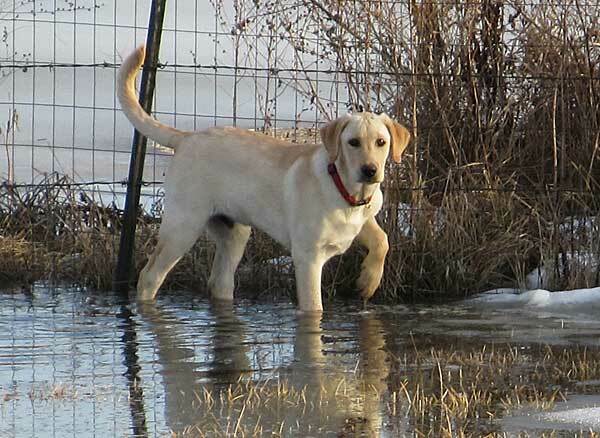 She hears the water and you can see her amp up.